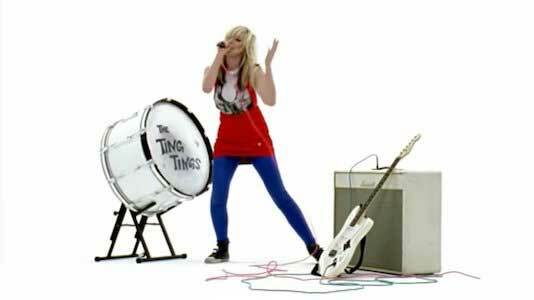 The Ting Tings are a British indie pop duo from Salford, Greater Manchester. The band is a two person setup that consists of Katie White (vocals, guitar, bass drums, bass guitar, cowbells) and Jules De Martino (drums, lead guitar, bass guitar, vocals, piano). Known for their pop punk inspired sound, the duo released their debut studio album, We Started Nothing, on May 19, 2008 by Columbia Records. The album peaked at number one on the UK Albums Chart, and spawned four hit singles, including “That’s Not My Name”. This track reached number one on the UK Singles Chart in May, 2008, and is the band’s highest charting song of its career. This track is very easy to clap to. In fact the booming bass drum makes it incredibly easy to not only clap, but stay on beat as you sing along to the lyrics. This beat is very reminiscent of the song “Hey Mickey” by Toni Basil, and Katie White’s vocals match Basil’s almost perfectly. However, this track never goes into the full 80’s pop sound that “Hey Mickey” leans on, instead opting for a more pop punk sound that fits with the lyrics about feeling invisible and unseen. Lead singer Katie White wears black chucks throughout this music video. The music video features the duo playing the song on an all white sound stage. They have a white amp and guitar resting on the floor, and a white bass drum with the band’s name on it is set up too. Katie White is wearing a white top with a red dress over it, blue leggings, and black high top chucks. Her color scheme is very British, invoking the colors of the Union Jack, and her black chucks give off a rebellious vibe. The whole ensemble really pops against the all white background and instruments of the setting, and really hones the viewer into the idea that Katie is who they should be paying attention to. Overall, this a fun and casual video that may not have very many frills or visuals, but it gets the idea of the song across well. Katie belts in front of a drum that bears the band’s name. Use the links below to get a new pair of chucks for your video.